OWC Mercury Elite Pro Dual Professional Grade Solution. Performance RAID Solution with USB 3.1 Gen 1 & eSATA. 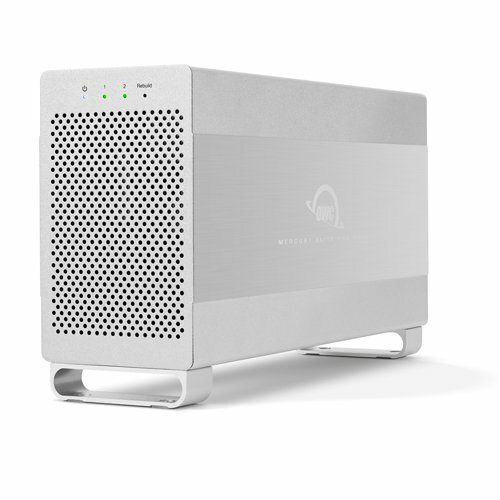 Mercury Elite Pro Dual is the best dual-drive hardware RAID solution for creative workflows, project archives, and system backups where reliability and versatile performance count. With two fast hard drives, easily configured in multiple RAID modes at the flick of an easy-access switch, Mercury Elite Pro Dual is built to seamlessly integrate with any work environment. Reliable hardware RAID maximizes the full potential of two 3.5" 7200RPM hard drives in the Mercury Elite Pro Dual. It comes configured in high-speed RAID 0 mode for the maximum sustained throughput from your drives. With speeds up to 407MB/s, that's fast enough for HD video workflows. Configure the Mercury Elite Pro Dual in RAID 1 mode for the extra security of mirrored data, set up a span of the two drives, or use them independently. Mercury Elite Pro Dual features both high-speed USB 3.1 Gen 1 & eSATA ports to offer the connectivity and versatility to work with your current equipment at extreme speeds. Drive-activity LEDs give you an instant snapshot of the status of your RAID, and intelligent power management conserves energy and reduces wear by automatically spinning down the drives when inactive. Highlights: Hardware RAID 0, 1, span, and independent modes. Fast USB 3.1 Gen 1 & eSATA connectivity. Accelerate your workflow with transfer speeds up to 407MB/s. Second-generation aluminum design with low-decibel cooling fan. OWC 3 Year Enclosure Limited Warranty. Includes: OWC Mercury Elite Pro Dual high performance Enclosure, 0.6 meter (24 in) USB 3.1 Gen 1 Cable (Standard-A to Standard-B),1.0 meter (39 in) eSATA 6G Cable, External power supply and power cable.